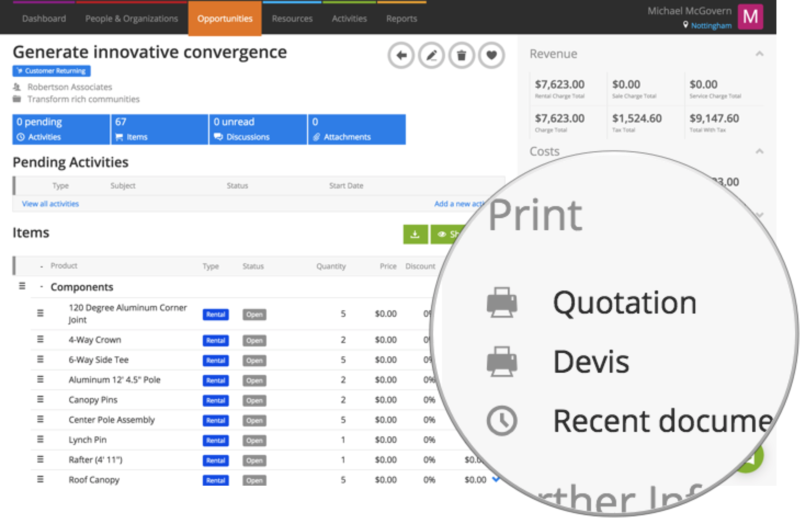 Use French, German, Spanish, or other languages in your quotations, invoices, rental agreements and other documents by translating them. 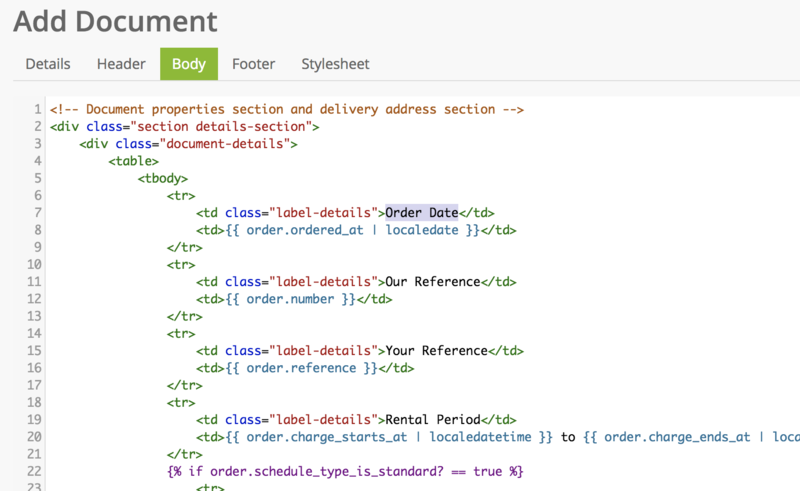 The documents that come with Current RMS are written in HTML & CSS, standard web design languages. This is great because it makes it easy to translate the documents into any language you’d like. It’s possible to have multiple document layouts active at any time, so if you operate in lots of languages then you can have translated versions of each document available to print. If you’re familiar with HTML & CSS or would just like to have a go, clone any of the layouts in Current to get access to the code. To clone a layout, head to System Setup > Document Layouts, find the layout you’d like to translate, and choose Clone from the menu. Once cloned, use the Header, Body, and Footer tabs to get access to the HTML. Generally speaking, anything in black can be translated. This text will usually be between matched pairs of tags in angled brackets. In the example below, “Order Date” and can be translated provided the text in red, blue, and green is left untouched. Use the blue Preview button to preview the document at any point. When you’re done, save the document using the blue Create Document button. It’s not a problem if you’re not confident with HTML. We offer a free service to modify document layouts. To get started, save a copy or download our translation Google Sheet and fill in the translations in your local language. Use the File menu in Sheets to do this. We’ve listed phrases for the most common customer-facing documents. If your language is more nuanced and words change depending on context (e.g. sonrasc, shonrasc), contact our Customer Success team before completing the spreadsheet and we’ll chat more about your requirements. 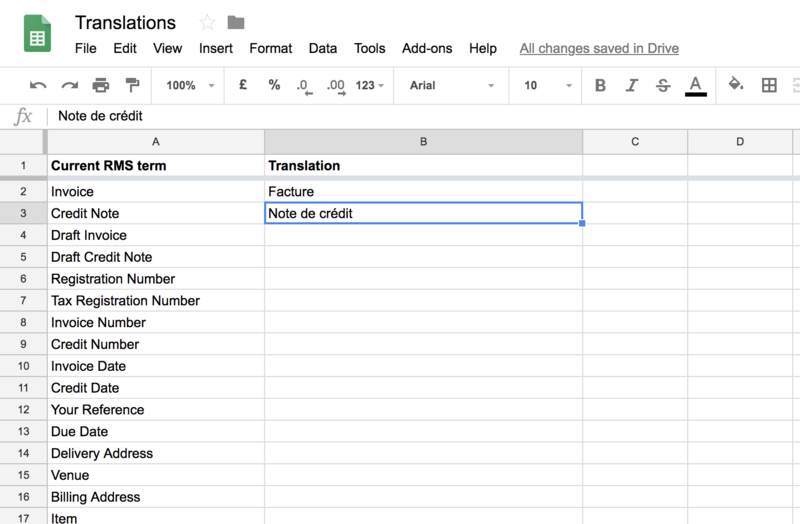 If you’d like additional information added to our standard documents, pop those translations on the spreadsheet you send across. For example, if you’d like to add “Contact Name” to your documents, enter this on your spreadsheet along with a translation. If you’d like custom documents creating in a language other than English, send us an example of what you’d like along with a spreadsheet that translates each of the words and phrases. You might also like to annotate a PDF with translations. Our team will let you know if anything isn’t clear.